Of all the aspects of colour, design is the one that is generally assumed to be something you have, or you don’t. Personally, I’ve never accepted that point of view about anything. Any skill can be learned, can be taught and can be practised. Including Colour design. Perhaps the best known treatise on colour is Itten’s “Art of Colour”. There’s an abridged version, Elements of Colour, that I remember leafing through at college many years ago. None of it stuck then, apart from the traditional colour wheel showing the primaries and secondaries – something I’ve now found to be a fiction. What’s all this about primaries? The whole idea of the blue, red and yellow primary model was popularised by a physicist called Brewster (wonderful sideburns, but he was wrong about colour) in the 1800’s and is based on a mistaken belief that red, blue and yellow are the primaries of light. They’re not, red green and violet-blue are. Yellow light can be mixed from red and green and blue light can be mixed from green and violet. If you’re interested, you can read more about this on the excellent Dimensions of Colour website. If you’re still labouring under the illusion that the primaries of colour are red, yellow and blue – well honestly, you owe it to yourself to update your knowledge because that theory was disproved over 150 years ago. And in painting too, I’ve found that the “three primary” model has some pretty serious shortcomings when applied on the palette. So let’s just take it as read that any theory of colour design based on the primaries of red, yellow and blue is built on a false foundation and will likely therefore have some serious flaws. How is Munsell useful for colour design? 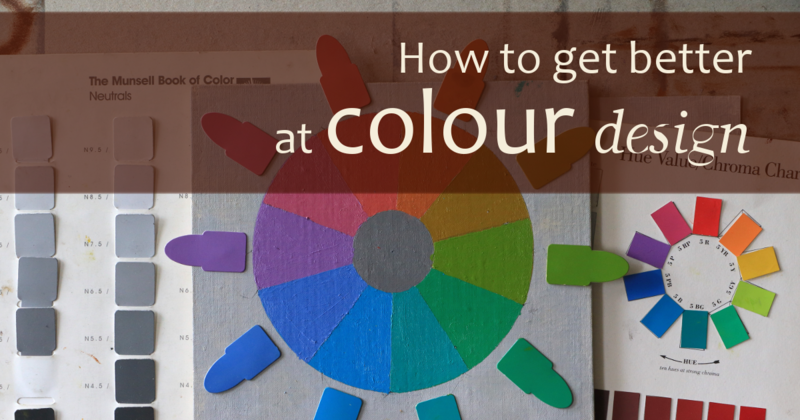 Well, whilst there’s certainly no shortage of people writing about colour design, there is one very rarely mentioned resource that may very well be exactly what we need to help us develop our facility with colour design for painting. And it’s based on Munsell. 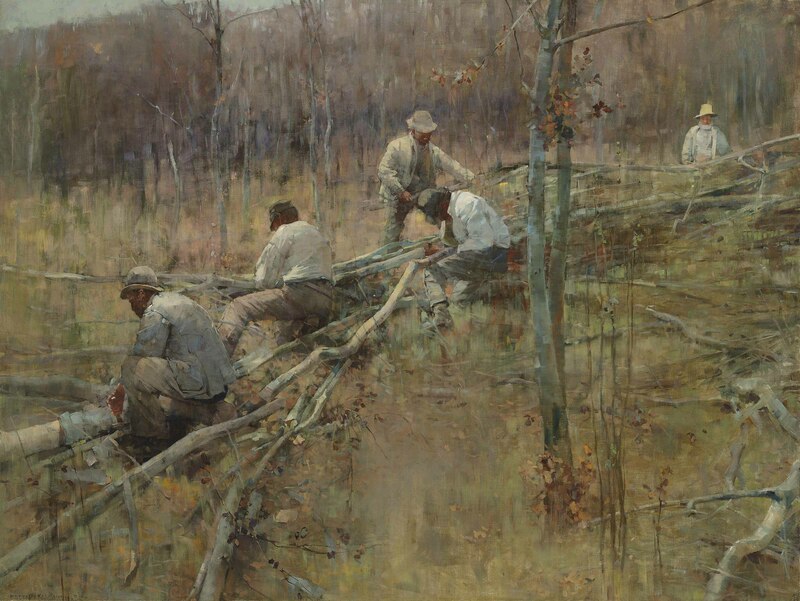 It’s the final chapter of the book Composition by Arthur Wesley Dow. As anyone who reads here knows, I’m a big fan of Dow’s book already, and have worked through many of the exercises. I like this book because it’s very practical. There is no theory. And its approach to learning is based on some of the strongest principles of deliberate practice. 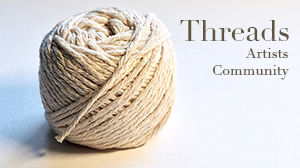 It presents a series of exercises you can work through designed to develop your ability to compose pictorially. It begins with composing just with line, moving on to value, and finally colour. I’ve spent probably two years, on and off, and made hundreds of little practice pieces following the exercises in this book. Did it help my sense of design? So I think it’s a fair guess that the colour exercises will be similarly effective. I’ve decided to work through these exercises sequentially, and to share what I’m learning and what skills I develop along the way here. I’d love to hear your thoughts and comments as I work through them. The exercises are centred around trying different combinations of colours in line designs, varying hue, value and chroma, one at a time. They are systematic and repetitive. And whilst I can imagine that some may find that anathema to colour, personally I find it’s the best way to make progress and develop skill in pretty much anything – including painting. 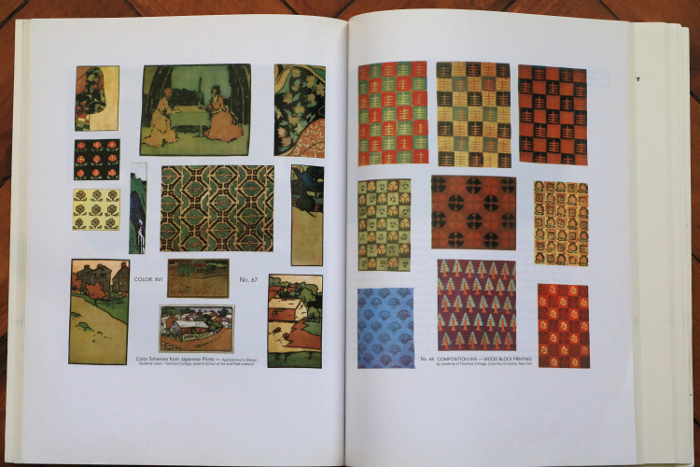 Here are a couple of quick snaps from colour plates from the book to show you the kind of thing to expect. I’m right at the beginning, and have just completed the first exercise. Munsell divides the colour wheel into 5 main divisions: red, yellow, green, blue and purple. 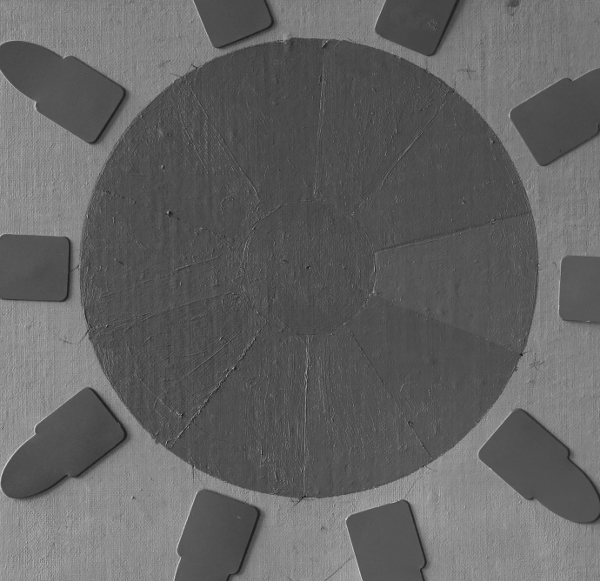 The first exercise is to paint a segment of each of these, at the same value and chroma, in a circle. In the centre goes a small circle of a neutral of the same value. This may very well have taken many attempts for me to work out, and there may have been some value in that. For my swatches, I chose chroma 8 and value 5. This is because it’s the highest chroma that all those hues can reach at a common value – value 5. Perhaps taking many attempts to work this out manually, without having a copy of the Munsell big glossy book, would have taught me much about value and chroma at different hues, and they may be part of the point. If you don’t have one, or the student book, an exercise like this would take some time. But it would certainly stretch you, and teach you a lot about what’s achievable with paint at different hues. Probably a good thing. I think the point of this apparently simple exercise is to begin to get a feeling for the 10 hues and how they interact by seeing them together at the same hue and value. 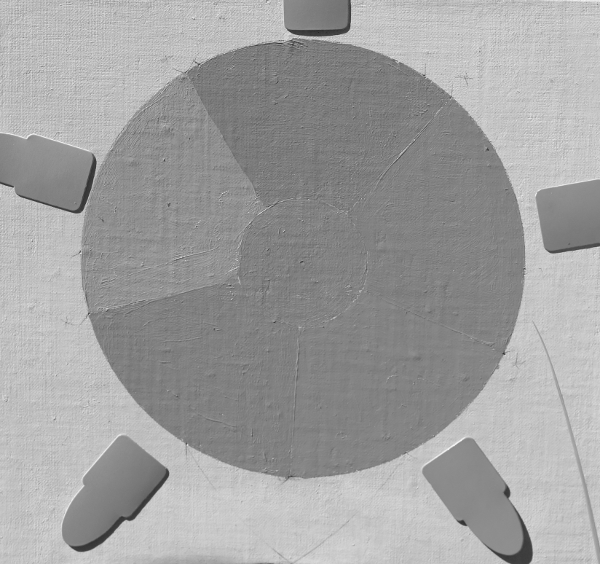 If you took this circle and spun it fast enough, it should result in a visual grey, just like the greyscale image – assuming the colours are right. I will know exactly what colours I’ve used and can repeat them, or vary them with complete control. The Munsell system of notation for hue, value chroma allows this. I can look back at which of my experiments I think were the most successful, and which weren’t, and know exactly what colours I used. Basing the practice on variations of hue, vale and chroma allows me to proceed with more control, varying only one dimension at a time if I want to. Colour is big. Too big, if approached by feeling and random ideas alone. This way, I gain a degree of control over what I’m doing that means I can work more systematically. Can abstract design really teach you about how to design realistic paintings? Well, you can decide after I’ve been working with it for a while. I’ll try, as much as I can, to relate what I’m learning back to realistic studies as I go. 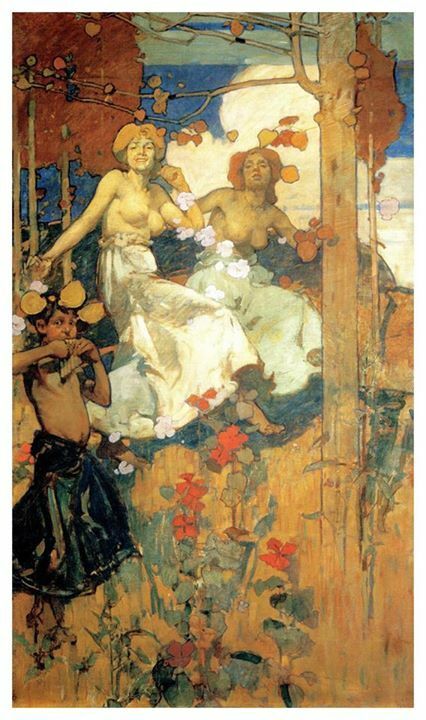 Also, there’s this: Frank Brangwyn, turn of the century British illustrator and painter, has always been a touchstone of fine composition for me. He began his artistic life designing rugs, his father was a rug designer too. 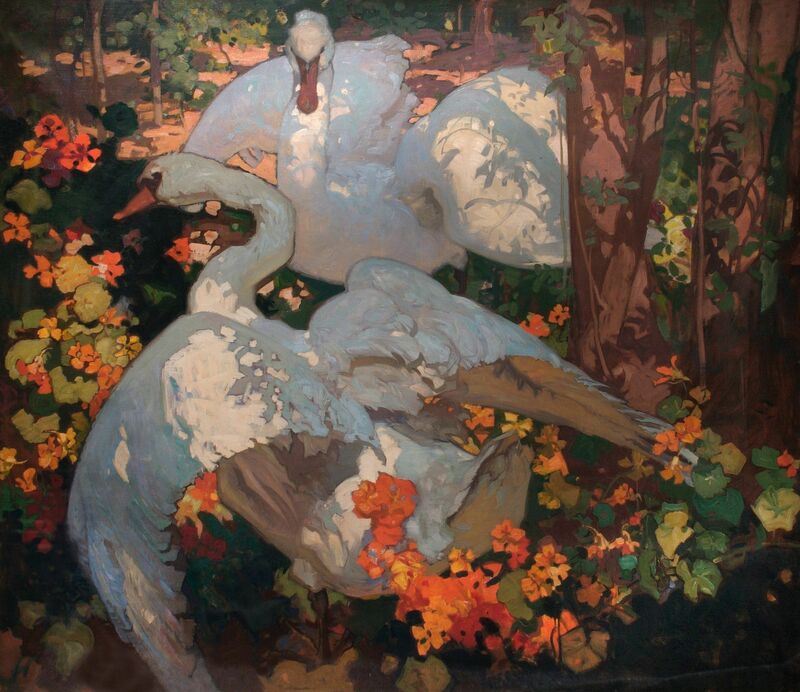 I believe you can still see those muted but beautifully balanced colours much in evidence in his paintings. His sense of design and spacing is also, I think, wonderful. His work is often decorative – in the sense that it consists of flat patches of colour – but he could also paint realism extremely well. For me, it’s the combination of his strength of design and superb drawing that makes his work so compelling. Now I’ve done the colour wheel, it’s on to line designs and trying colour combinations. I plan to work an hour a day on this, most days, and will update periodically on my progress here – and also on facebook, if you follow me there. I’m really excited about this new exploration, and I hope you are too. Stick with me through the inevitable frustrations and hopefully breakthroughs and we’ll see what we can learn. Well, it’s a strong point of view I for one will follow with interest. 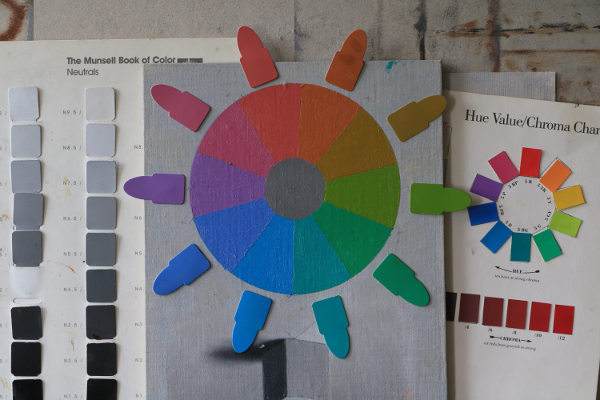 By the way, is Munsells wheel the same as Hal Reed’s Analogous colour wheel and do you know if they/it can be purchased in the UK and where? Good stuff, thanks for posting! Interestingly, the Munsell student colour book has no swatch for 5Y at value 5, chroma 8. Perhaps because they aren’t reproduced glossy. Anyway, looking forward to seeing what you come up with! I think this is the most important aspect of painting by far Paul. All paintings however realistic are essentially abstract ie they must work as pieces of colour on a flat surface. 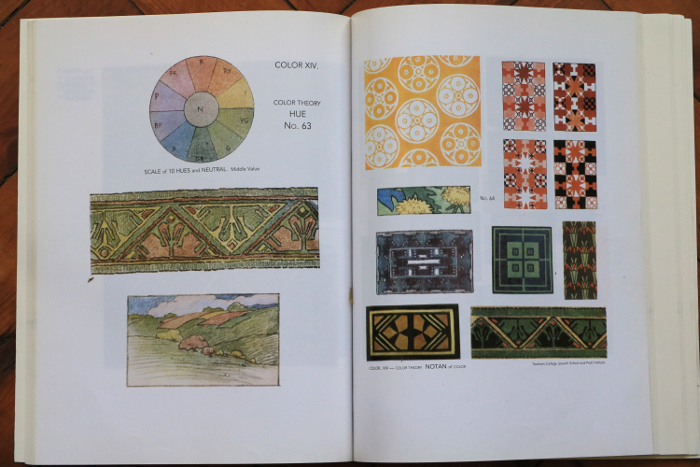 I think I have mentioned before a book called “Colour Structure and Design” by Richard Ellinger which I have found very useful, particularly the stress on breaking down colour into HVC and design each element separately. Personally I think that all the other elements, line, shape, direction etc stand for nothing if the colour is bad. Very interested to see how your studies progress. Always love reading your posts. Lots of food for thought, well supported by references to burrow deeper! I wondered if you had come across Stephen Quiller. If not, I think that you might find his work interesting. Do you rate the book? What do you feel it taught you, or, how do you feel it helped you? I’m genuinely interested. Thanks. I’ve been learning so much reading your posts. Thank you for sharing the information. I don’t have the Munsell book yet, but I’ll try this exercise. Apples and Oranges my friend…not the same. For me anyway. Very true in the theatre where the old strip lights and the new LED lights can produce a yellow out of red green and blue. In this case you are throwing LIGHT. Maybe it’s just me, but when I paint I am not depositing light on the surface . Light and pigment…not the same. I never said that mixing light and mixing colour are the same Glenn, they plainly aren’t. Mixing light is additive, paint is a version of subtractive mixing. But the original blue, red and yellow primary theory came from someone (Brewster) observing light. He was mistaken,, but art teachers still teach these as the primaries of paint. The truth is that there are no primaries in paint, precisely because paint is different from light. No pigment reflects light from a narrow enough band of the spectrum to be pure enough to be a primary. The whole idea of primaries, in the same sense that they exist in light, is a myth. I’m sorry if you got the impression too that I was saying they are the same, they aren’t. My point was that the blue, red and yellow primarily theory is wrong – and it has been applied to paint, too. And as you say, paint is not light, so in a sense, it’s doubly wrong! The main 5 hues of the Munsell wheel aren’t primaries and he didn’t intend them to be. There are no primaries in paint because pigments are too impure. Munsell was trying to create a more balanced hue wheel that didn’t favour the “warm” colours more, as the red yellow ad blue primary wheel does. In light, the three primaries (red, green and violet-blue) are primaries because they can’t be mixed from other wavelengths of light, and because all other wavelengths that we perceive can be mixed from them. There are no pigments in paint that behave in the same way. There are no three pigments or tube colours that you can mix the entire gamut of paint from, it’s a myth I’m afraid. You can mix a range with three, but it’s limited, more or less limited depending on which three you choose. The so called split primary palette allows a wider gamut, because it adds more colours although there is a lot of overlap of course. But you still can’t mix the full gamut available with paint either, just a less limited one. In a sense, these disagreements are beside the point. Most palettes that people generally use are limited in one area of the gamut or anther, so called “primary” palettes are particularly so. Personally, I use very limited palettes depending on what I’m painting – in that I only put on my palette what I need to paint whatever my subject is, or to make sure I can reach the range of colours I want in my painting. By the way, I’d be really interested to know what yellow and magenta you use? It will help me when I come to test that palette out. Your position on color and “primaries” in terms of light and paint is better explained and understood in this reply than in the post. It helped me see your point. Hi Paul the colors I use (Golden Acrylics) are Thalo Blue (green shade) Primrose Cad. Yellow, Quinacridone Magenta and Carbon Black (+ Titanium White). Your comment, “blue, red and yellow primarily theory is wrong”.. I’m not sure I would say it is “wrong”, I would say it is limited in that no one blue, red or yellow can create every single other color. So it is limited, but not exactly wrong. The 3 primiaries can and do create all the secondaries, tertiaries, and every variation of them. and no combination of colors can create the primaries. When people say the Munsell wheel is correct and the RYB theory is “wrong”, I just can’t agree with that. Limited – yes, wrong – I’m not seeing that. I guess this is why ,after many years, I have a dozen colors on my palette, including black and white with another four or so within reach. Even if I could mix everything from three I wouldn’t .Llfe is just too short. Agreed! The thing that surprised me most about testing out a primary palette was how long it took to mix low chroma colours. Much quicker to have a few earths ready. You absolutely can mix low chroma colours with a high chroma, limited palette, it just takes much longer! Well, it takes me much longer, anyway. Are you blogs also posted to the Mastering Colour facebook site? I wasn’t sure if this group is active. I’ve applied to join but have not been accepted. I am currently working the Munsell colour exercises. Gail, I’m so sorry! I’ve just approved your request to join the group, I must have missed it. I’m getting inundated with requests to join from people who aren’t on the course and I’m afraid I must have missed your in all the clutter! I’ve long been having doubts about primary colors. In my practice i have observed the limitations of primaries. Having a limited budget, i tried to work with the primaries only and got a less than ideal output. This blog is insightful. It sheds light to the things I have observed. Although, I still am deliberating with myself whether we should stop teaching the primaries in schools. The theory simplifies color in a way young minds can comprehend. I do agree we should stress its limitations and emphasize that it is not the “be all and end all” of color. I think elementary students can start with the intro of primaries in its proper conetxt. The secondary and tertiary students are mature enough to grasp the conflicting ideas and theories, eventually develop and embrace a system of their own. Overall, I am excited to look into the books you suggested. Hopefully they are available here. Will go back and look at the article in depth later . I was curious if there is anyway to convert the RGB CYMK profiles that you can pinpoint on a photo etc. into paint . I know that they are used for light backed pixels etc. But it just seems that since a printer can scan a photo and take 4 + colors plus the white paper and reproduce a color …then it would seem that there would be someway to break this down with math and create a formula for matching colors . The left side of my brain doesn’t understand why this can’t be . As always, you have distilled some valuable points from this complicated business. I always tell my own students to consider the colour wheel as simply a graphic device or recipe/reference book that aims to establish the relationships between hues. It is not a model of how light actually works. I use the Munsell circle since I was introduced to his name many years ago by an art lecturer (without much further explanation) and followed it up with my own curiosity (which is what lead me to your blog nearly 10 years ago!). Have you come across the Android app “Munsell Color Chart” which does give a kind of virtual 3D model of the colour space? Of course, it will not be colour accurate as it is dependent on an individual device’s screen. However, I’ve found it helpful in explaining the Hue/Chroma/Value model to others. Thanks you again for sharing your practice. Wow!! This is interesting but it’s blowing my mind a bit. As you know Paul, I’ve just started out (relatively speaking) with the watercolours so I wonder how much of this could be transposed into a medium where randomness seems to be welcomed. One point of interest was when deciding on what paints to buy last month and reviewing the forums for the voices of experience. There seemed to be a separation into one school of thought which states you never need anything more than a set of split primaries and maybe a black(ish), bearing in mind that the paper is your white for transparent colouring. The other school of thought was basically picking up on the better vibrancy on offer by having a wide range of colours rather than mixing. Whilst I value the benefits as a beginner of getting stuck straight into mixing from the three primaries (warm and cool versions of red, blue, yellow) I bottled it and was tempted into buying a large set of colours – the entire W&N student range in half-pans basically. I was also considering buying some tubes for the split primary method but now reading this it does make me wonder about those choices. I’ve since re-read about this and it would seem that there is disagreement even about which colours would make up the magic-six. Obviously there are different manufacturers and different personal preferences at play but it makes for interesting reading. For the time being I’m going to be simply aiming for making a tree green and a bus red but I’m keeping these little snippets of colour info in the back of my mind for later on. It would absolutely translate into watercolour, it doesn’t have to be exact. 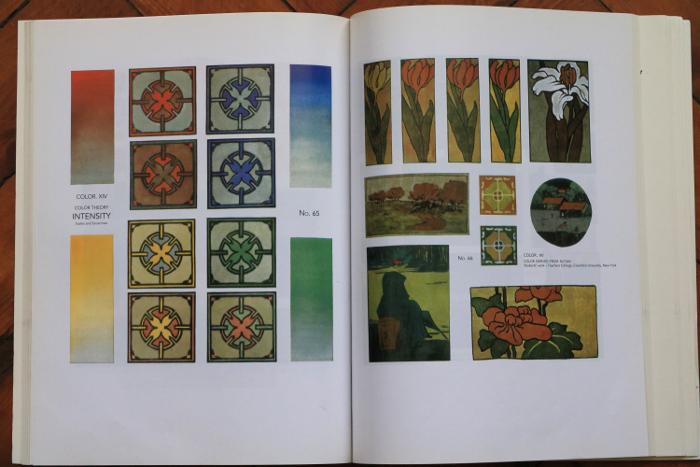 In fact, all the examples in the book appear to be watercolour. I’m just an oil painter so that’s what I’m doing. Ah the split primary palette. Basically just adding more colours. There’s nothing especially different about that palette, it just gives you a wider range because there are more tubes of paint. Michael Wilcox is the best known advocate of it although he didn’t invent it. Bear in mind that the science he justifies it with is fundamentally wrong. Basically, it boils down to this: Adding more tube paints increases the gamut of colours you can reach 🙂 Kind of obvious, really. that’s the only real difference between that and a strict “primary” palette.